Need some new fresh and exciting ideas for a colorful bathroom makeover? This article features so many beautiful ideas on how to create the perfect place to get ready for your day. 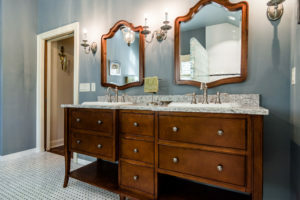 Texas designer, Lieve Saether shares how she completely transformed an outdated space into a vibrant bathroom shared by three sisters. Who wouldn’t want to live here? Check out Bathroom Gets a Fun, Colorful Makeover by Annie Thorton with Houzz. Learn how this bathroom came to life and how the designer used unique pieces to make this a one-of-a-kind space. Check out the Sandmark Custom Homes Houzz profile by clicking here to learn more about our projects and see client reviews.